You may need to perform a system update. Find out how to carry out system updates here. Please note: do not register your Nintendo Network ID (NNID) on your target system prior to the system transfer. Your NNID will be automatically transferred along with your data. Registering your NNID on the target system beforehand will make data transfer impossible. If you have data such as photos and recordings in the target system and wish to keep them after the transfer, please copy these to a microSD card first. On both the source and target systems select 'System Settings' from the HOME Menu. Then select 'Transfer from a Nintendo 3DS system' and follow the instructions on-screen. When asked 'Are you using an SD card or miniSD card with your system?' Select 'No'. The transfer will begin. Please wait until the data has been transferred. Please note: data on the SD card will not be moved. Please note: do not turn off the power during the transfer. Remove the microSD card from the source system and insert it into your New Nintendo 3DS system. 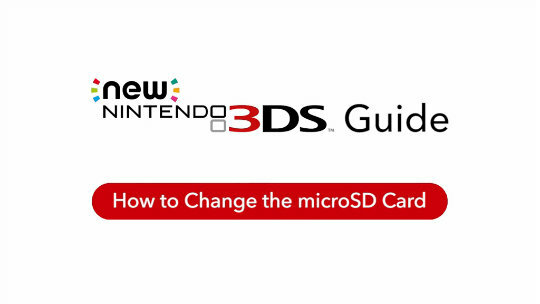 Watch our helpful tutorial video below to find out how to change the microSD card of your New Nintendo 3DS or New Nintendo 3DS XL system. Once you have moved your microSD card, the transfer is complete.